Since 30 years ago the Brompton idea first came up, this English folding bike was continuously improved but it never changed completely. The focus was always on asymbiosis of technology, design and functionality.. What also makes a Brompton special is the intricate production that is a tradition with the English manufacturer. Until today Brompton is handcrafted in London: All frame parts are manufactured and assembled by the company itself. This results in a very high quality folding bike. Brompton folding bikes are designed to make everyday life easier. Meaning, it has to prove itself in stressful, everyday situations like commuting to work in public transportation like buses or trains and carrying it through the city. Among commuters Brompton has become very popular. And we gave the Brompton an electric upgrade: the . EBS Bromptonaut - Conversion Kit for Brompton. Retrofitting with the EBS Bromptonaut provides additional comfort and time savings. With an e-drive the Brompton on-par with normal bikes and is therefore more efficient over short distances . Uphill sections are now easier to tackle and use less power since the Folding Bike Conversion Kit offers great climbing ability. will stay the same even with electric components. The small and silent EBS Mini Folding Bike Motor excels by its low weight and small size. Due to the smooth-running freewheel the Brompton can effortlessly ridden with the system switched off. The small Mini Folding Bike Motor is well suited for narrow forks and can be used for other bikes than Brompton with a front wheel hub spacing of 86mm instead of the usual 100mm. These beneficial properties are possible due to its sophisticated construction: Encased in its housing is a planetary gear that saves unnecessary material and provides the motor with good climbing abilities. 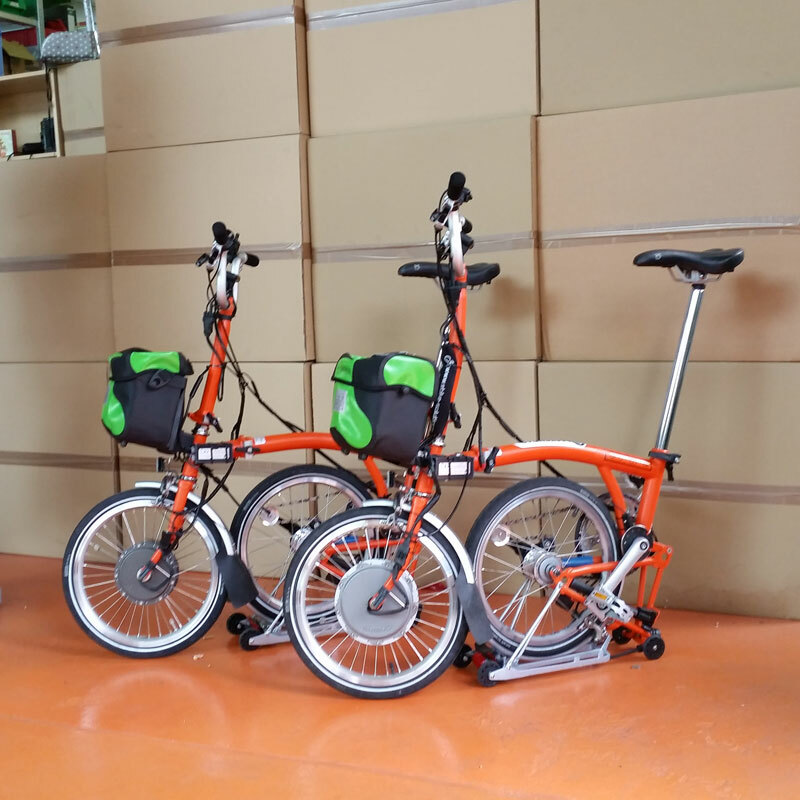 We offer the Bromptonauts in two versions. The AKM-F engine is particularly suitable for commuters and frequent transport by bus and train. It is small and very light with only 1.6 kg. This makes it much more comfortable to carry. It is suitable for flat or slightly hilly routes. The Crystalyte SAW 20 is bigger and heavier than the AKM-F, but also more powerful. It is particularly suitable for use as a touring bike. Long, heavy distances on excursions or bicycle trips are exactly his profession. Both engines have been specially designed for Brompton's narrow front forks, which have an installation width of only 75 mm instead of the usual 100 mm. When you want to ride an electrified Brompton but, call us so we can give you advice before buying one. 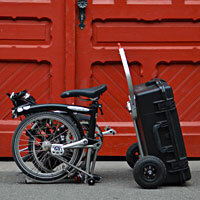 Cycle comfortably uphill, comfortably reach speeds of 25 km/h and more, increase your range and stay flexible: to the EBS Bromptonaut 250W pedelec conversion kit. Popular extensions to Brompton are the handlebar bags. They can be attached to and removed from the folding bike in one easy step. 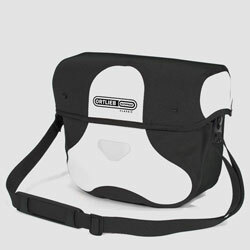 The modern bicycle bags have plenty of space for notebooks, folders and valuables. With their water-repellent surface, they offer protection in all weathers and quickly become an indispensable companion for every Brompton rider. Combined with a trailer, the electric Brompton is often used for city tours and urban travel. It is often taken on holiday because of its compact size and the necessary luggage on board. With trailer and bicycle bag, it is also suitable for longer trips : Because thanks to the longer range of an electric Brompton, longer distances can be covered without difficulty.